« Did Jesus’ Mother and Brothers Lose Faith in Jesus? I am quite sure Norelli’s new perspective won’t be the final word. Before I can come to any view myself, however, I obviously need first to understand at least the core of his analysis. So as I plough through the slim French language popular summary of his argument I will copy chunks of my bad translation and semi paraphrase here. This section covers pages 48 to 52 of Ascension du prophète Isaïe and continues on from the post AoI: Contents, Manuscripts and the Question of its Composition. I have added translated text from the AoI at earlychristianwritings. In this section Norelli is explaining why be believes the AoI is independently adapting a source also known to the author of the Gospel of Matthew. That the composer of the AoI could do this is a sure sign that he was writing before a time when the Gospel of Matthew took on any authoritative status. The second part describes the ascension of the prophet Isaiah into the heavens. The Heavenly Ascent is a well-known genre. But a comparison of the Ascension of Isaiah’s ascent with the celestial journeys documented in other literature in Judaism reveals a difference. In the first six heavens the vision of Isaiah does not depict the content we find in traditional celestial geography (e.g., the home of the blessed contrasted with that of the damned; the scenes of the heavenly Jerusalem and the Temple; the angelic creatures surrounding God such as in the vision of Ezekiel). It is only in the seventh heaven that we find the glorious angelic choir singing their praises where God dwells with his Well-Beloved (the pre-existent Christ) and the Holy Spirit. The use of a literary genre (the heavenly travel narrative) known to the reader builds up an expectation that will be quickly dashed. The reader is thus alerted to the realization that the text is not going to convey the usual information about the celestial geography and is prepared for new messages. “Understand, Isaiah and see” (10.18 for the descent; 11.22 for the ascent). We can conclude that the passage on the “human” life of Christ (11.2-21) contains the bulk of the revelation made to Isaiah – that is, the message that the author of the second part wants his readers to take in is the mission of Christ to down to earth. 5. And he did not approach Mary, but kept her as a holy virgin, though with child. When we compare the Ascension of lsaiah 11.2-5 and the narrative of the virginal conception of Matthew 1.18-25 we immediately notice a close resemblance that presupposes a literary relationship between the two. The unanimous opinion of the scholars is that the Ascension depends here on Matthew: an apocryphal text can only ever be secondary to a canonical text! Our thesis is different: we think the Ascension and the evangelist have drawn from the same tradition. The exegetes who have studied this passage from Matthew (without any attention to the Ascension) have identified a source behind Matthew, a pre-existing narrative that the evangelist has reworked according to his own theology. What is striking is that the words and phrases that these exegetes see as Matthew’s additions to his source – as editorial elements – are absent from the Ascension. The most obvious example is the citation of Is 7.14, with its introduction in Mt 1.22-23. Everyone agrees that this quote comes from the evangelist; but it is absent in the Ascension, or rather it appears in another context, in 11.13, where it cannot have come from Matthew. Another example: the expressions “her husband” and “not wanting to expose” in Mt 1.19 are thought to be additions of the evangelist; yet they do not appear in the Ascension. In the same verse (Mt 1,19), the exegetes attribute to the pre-existing tradition the words “he wanted” and “return her”, which are found in the Ascension, but they attribute to Matthew himself the adverb “secretly”, missing from the Ascension, in between these two words. According to several exegetes the motif of the Joseph’s “dream” mentioned in Mt 1.20 and 1.24 but absent from the Ascension, comes from the common tradition; but I think there is good reason to attribute it to the evangelist. If the Ascension had it in its source, it is poorly explained why it would have been removed; however, its presence in the Gospel is explained better if one grants that Matthew himself introduced it to link the episode to the two accounts of dreams that follow (2,13-14. 19-21) than if he received from the tradition. I conclude that the Ascension does not here use the Gospel of Matthew, but rather the source used by the evangelist in Matthew 1.18-25. Additions and changes the Ascension makes to its source can be explained by the theological perspective of the Ascension: thus, in v. 4 the identification of the angel with the angel of the Spirit, that is, with the Holy Spirit itself; elimination of the message from the angel in Mt 1.20; the insistence on Joseph’s silence in the Ascension in order for the devil to ignore the human form taken by the Lord on earth. The proof of the independence of the Ascension in relation to Matthew certainly requires a very technical analysis, but it has not only an academic interest. It requires us to give up the image of an author who, seated at his desk in some indeterminate time, composes a tale from a gospel laden with indisputable canonical authority, and replace it with the image of an author who, in parallel to Matthew, performs the same job as him, and reinterprets the tradition about the birth of Jesus, set in a very specific period of early Christianity. This work of interpretation can only have occurred very early, when one could still access the tradition without going through the Gospel of Matthew, and where the Gospel had not yet acquired the canonical authority that allowed it to displace all competition. Next: the strange tale of the nativity. Posted on 2015-02-25 11:01:30 GMT+0000 by Neil Godfrey. 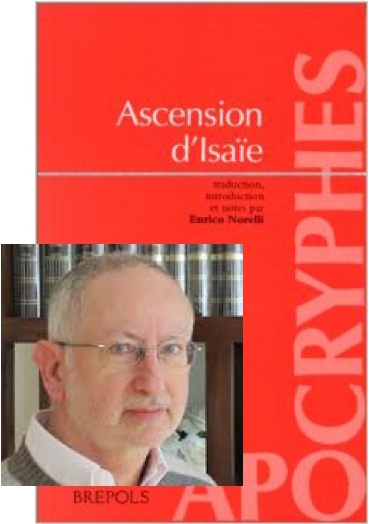 This entry was posted in Biblical Studies and tagged Ascension of Isaiah, Norelli: Ascension d’Isaie. Bookmark the permalink. Hmm. Unfortunately, Norelli’s line of argument here seems to lean heavily on his opponents’ presumed belief in sources (“M Sources” I believe they used to be called) underlying Matthew’s story here and is of less use to those of us who hold to a Occam-friendly, Goodacre-esque “Matthew invented everything he didn’t crib from Mark” view. It is probably a fair point to note that belief in “M Sources” (or “L Sources” for that matter) is something that has declined over time, more so than belief in Q (although Ehrman hadn’t gotten the memo by the time he wrote that Did Jesus Exist book). All that said, of course, there could still be an argument for a common source behind these parts of AoI and Matthew; it just ought not to assume a source behind Matthew but rather argue for it (a lot of the detail-level work on the Synoptic Problem is probably relevant here). I apologize that I have not read Norelli, but has anyone summarized the arguments that have been taken up against the above scholarly position that 11:2-22 were the most recent addition to the text? Some (not you, Neil) do seem to be dancing on the casket of that interpolation hypothesis, but I am not really sure why. I have not yet been able to access any detailed discussion of the reasons for Norelli’s rejection of the interpolation thesis. In desperation I even emailed Norelli himself (in French and English) but I imagine it’s a very long shot if I will get a response. There are also parallels between AoI 11 and Infancy Gospel of James ( aka Protevangelium of James): 9-20. Look for the interposed lines of text, especially the capitalized words. AoI 11, Infancy James 9-20, and Matthew 1:18-25 are interrelated. AoI also contains docetic material, and the rabbinic tradition that Jesus was put on a tree. All in all, a rather tangled set of shared sources. These are only observations, I leave the explanations to others. and she was espoused to a man named Joseph, a carpenter, and he also was of the seed and family of the righteous David of Bethlehem Judah. 3. And he CAME INTO HIS LOT. and Joseph the carpenter WAS DESIROUS TO PUT HER AWAY. 9. And after she had been astonished, HER WOMB WAS FOND AS FORMERLY BEFORE HE HAD CONCEIVED. 10. And when her husband Joseph said unto her: “What has astonished thee?” his eyes were opened and he saw the infant and praised God, because into his portion God had come. 14. And MANY SAID: “She has not borne a child, nor has a midwife gone up (to her), nor have we heard the cries of (labour) pains.” And they were all blinded respecting Him and they all knew regarding Him, though they knew not whence He was. and crucified Him, and He descended to the angel (of Sheol). 22. And the angel who conducted me said: “Understand, Isaiah”: and I saw when He sent out the Twelve Apostles and ascended. 34. And this angel said unto me: “Isaiah, son of Amoz, it is enough for thee;… for thou hast seen what no child of flesh has seen. 40. …such things ye will read. and watch ye in the Holy Spirit in order they ye may receive your garments and thrones and crowns of glory which are laid up in the seventh heaven. I once went through the writings of Justin comparing details with the gospels including the Gospel of Peter and the Protevangelium of James; last time I looked I saw it needed major revision and corrections. I would like to take time to repeat the exercise and add the AoI into the mix. I’ll keep your post in mind. Until 60 AD, the churches had no gospels. Only the OT. And the apocrypha. A scholar recently said the latter are the origin of the NT. So here Norelli seems to have opted for the S/L2 versions which have “glory” (S) and “glories”(L2) instead of E (Ethiopic) version (“praises”) that both R.H Charles and M.A. Knibb followed in their translations. I don’t have access to Norelli’s larger work so I don’t know why he chose S/L2 over E in this instance. None of the rulers of this world understood this, for if they had, they would not have crucified the Lord of glory. Has anyone read, “Disciples of the Beloved” by Jonathan Knight. It seems I remember just a piece of it from Roger’s Simonian Thesis pieces. I haven’t (I’m sure Roger, Earl and others have, though, and Carrier lists it in his bibliography) but it’s now on my reading list. I have read the book. It looks, however, like it may be superseded by a book Knight has coming out soon: The Theology of the Ascension of Isaiah: A First New Synthesis. It was due out in February but has not yet been released. I expect it will incorporate some proposals he made in a chapter he contributed (“The Christology of the Ascension of Isaiah: Docetic or Polymorphic,” pp. 144 – 164) to: The Open Mind — Essays in honour of Christopher Rowland. A few pages of the chapter can be previewed in Google books. I will wait and put the new book on my reading list. Thanks for info Roger. 2)then google the ‘google books’ listing. Found Open Mind on Book ZZ! I have finished reading it, and it has the stench of apologetic exegesis all over it. Of course he treats the Ascension as it is found currently with the pocket gospel included and doesn’t talk about the original part separately. He concludes as opposed by Norelli (and most scholars) that the Ascension is not docetic but polymorphic (semantics if you ask me) and actually anti-docetic. The gymnastics he uses to get to this conclusion is apologetics of the highest order. Actually, I find Roger’s argument about what should be found where the pocket gospel is and the possible relation to the revelation group to be much more persuasive.